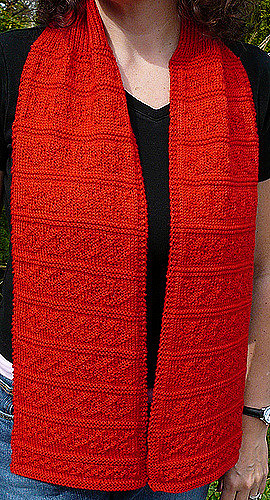 I designed this scarf for the OFA Red Scarf Project in conjunction with Donna Druchunas’ blogtour for Ethnic Knitting Discovery. Fifty percent of the proceeds from this scarf will be donated to OFA to support their wonderful work on behalf of foster children in college. 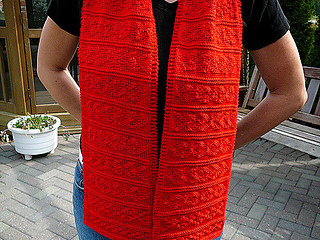 The scarf uses a provisional cast on (I used Judy’s Magic Cast On), and simple knit/purl patterns to form a design that looks complicated but is easy to knit. It’s readily adaptable to be longer (or shorter). Errata: In version one, the pattern says “having bound off after chart B” when it should read “having bound off at the end of chart E”. (Also, the key doesn’t clearly indicate that the last row of chart E is a bind off row, not a purl row).